Most see a disability as an impairment of normal function; however, some see a disability as a source of creativity and innovation. Being blind means that one does not exist in the perceptual world of sight; on the contrary, that individual may have a greater presence in the perceptual world of touch, taste, smell, and hearing. Therefore, a conclusion may be drawn that a perceptual world is different for each individual, but that perceptual world contributes to the experience of the individual regardless of its constituents. In a few case studies of paradoxical neurological disorders Oliver Sacks illustrates the perceptual words of those who differ from the norm. Oliver Sacks was a British born neurologist that spent the majority of his professional life in the United States. In addition to being a well-known physician, Sacks was also a naturalist and author who wrote many best-selling books; including, The Man Who Mistook His Wife for a Hat, and An Anthropologist on Mars. A common motif that is explored throughout An Anthropologist on Mars is sight. The multiple sections of An Anthropologist on Mars detail longitudinal case studies, with a majority of them pertains to discrepancies in visual perception; however, all of them pertain to individuals that use their afflictions as a source of creativity. Sight happens to be a very relatable topic of interest to Sacks, since he was documented as having been diagnosed prosopagnosia, or the impairment of facial recognition. As a physician, Oliver Sacks fosters a relationship with the individuals of his case studies that transcends the traditional doctor and patient relationship. In the section The Last Hippie, Sacks visits his patient Greg in an in an assisted living facility for several years and even indulges Greg and his love of rock music by arranging to take him to a Grateful Dead concert. In An Anthropologist on Mars, Sacks outlines each of his case studies with a different section of the novel that are all mutually exclusive from one another. These sections illustrate: a color-blind painter, a blind man who believes he is living in the sixties, a surgeon with Tourette’s syndrome, a man who lost his sight in early childhood to regain it in his mid-fifties, an artist who creates his artwork solely from memory, a young artist savant, and an professor with autism with extraordinary empathy for animals. Sacks goes to great lengths to get to know his patients on a personal level and learn as much as they can about how they go through life, oftentimes shadowing them at both work and home to get a sense of both their private and personal lives. In the case of the surgeon with Tourette’s syndrome, Oliver Sacks lived his Bennett, the subject of his study, and scrubbed in on several of his scheduled surgeries. 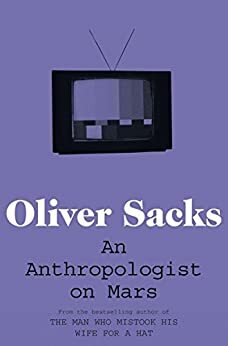 The reason Sacks is able to share so much insight on the perceptual worlds of the subjects of his case studies is that he fosters close personal relationships with them. I believe that through several unique case studies, Oliver Sacks is making a statement about perceptual disabilities illustrating the concept that those afflicted by perceptual disorders are not characterized by their disorders, rather that the disorder is characterized by the individual. In the section an Anthropologist on Mars, a professor at Colorado State University who is autistic, is interviewed by Sacks and it is clear that she is aware of her strengths and weaknesses. “Temple’s attitudes seem similar to this: she is very aware (if only intellectually, inferentially) of what she is missing in life, but equally (and directly) aware of her strengths, too- her concentration, her intensity of thought…” (Sacks 277). Despite Temple’s difficulty pertaining to social perception, she is able to live a rich and productive life; ironically, empathizing with other animals. This autistic professor has a doctorate in animal science, but lacks the ability to distinguish tears of joy from tears of sadness; however, she is not defined by her ability to judge social cues but rather by her valued contributions to the scientific community. The scientific community, specifically the medical community, can also benefit from another subject of Sack’s case studies. Tourette’s is a compromising disorders that affects the ability for individuals to pursue certain professions due to nervous ticks; in opposition to traditional thought, surgeon is not one of those professions. “His whole identity at such times is that of a surgeon at work, and his entire psychic and neural organization becomes aligned with this, becomes active, focuses, at ease, un-Tourettic” (Sacks 98). Sacks depicts the personal life of Bennet as characterized by extreme ticking; on the contrary, in his profession Bennet is able to perform surgery with the utmost care and precision. Despite Bennet’s nervous ticking, he is able to meet the expectations of his profession where under traditional standards he would be discriminated against. Discrimination is a concept usually given a negative connotation; however, in regards to the visible light spectrum discrimination is essential. In the event of an accidental car crash, Johnathan lost the ability to discriminate color. “Although Mr. I does not deny his loss, and at some level still mourns it, he has come to feel that his vision has become ‘highly refined,’ ‘privileged,’ that he sees a world of pure form, uncluttered of color” (Sacks 38). An artist in his mid-fifties that made formerly made a living off of his colored painting was forced to reinvent his style so late in life due to a tragic accident. Despite losing the fundamental aspect of color, Johnathan was able to prosper in a new black and white phase of his life, evidence that deficiencies in perception is not what defines us. The contributions to our perceptual world is different for each individual, but that perceptual world contributes to the experience of the individual regardless of its constituents. Oliver Sacks does a phenomenal job of illustrating the boundaries of the perceptual worlds of the subjects of his case studies. Sacks provides in depth psychological and biological analysis regarding several unique case studies of which demonstrate that those afflicted by perceptual disorders are not characterized by their disorders, rather that the disorder is characterized by the individual. Oliver Sacks delves deeply into the lives and minds of uniquely different individuals, including Temple Grandin, who has autism and studied "normal" or "neurotypical" people like an "Anthropologist on Mars," because she had no clue about how other people think or act and she desperately wanted to know how she could go about having social interactions in the world she had landed in. The essays in this book, including another one about a surgeon with Tourette's who is able to do delicate, difficult operations for 6 hours straight and who then goes home and punches holes in the dining room walls of his house, are all fascinating, perceptive, and eloquently written. This is the first book about autism that I read after my own son was diagnosed at 3 1/2. He had regressed in language and spoke only in a perseverative babble for years. But, for him, music was the way "back into the world." He taught himself to read at the age of 9 through studying the lyrics of the songs he was listening to on the way to countless therapies. Utterly incredible, but just this last week, my son with autism, Rio, aka "Soulshocka," was chosen to open the show, performing his own original rap song at the Club Nokia in L.A. in a Tribute to Temple Grandin herself. Somehow, the circle seems magically complete now. 5.0 颗星，最多 5 颗星If you liked "the man who mistook his wife for a hat"
If you liked "the man who mistook his wife for a hat", you will like this book. It has a similar structure with Oliver presenting a case and describing his ideas about what he thinks is going on. Personally, I do not think I would have enjoyed it as much without my kindle to look up words every couple pages. If you are not familiar with Oliver Sacks, you should know that he uses A LOT (I mean a LOT) of footnotes. And it can be disruptive to the flow of reading. Kindle note: The footnotes that come up on the bottom sometimes do not contain the entire thing, so you have to click "go to footnotes" and read it there (it usually goes on to the next page) then go back to the number of the footnote and click it to go back to your spot. Its slightly annoying, but I give the book five stars because Oliver Sacks is a fantastic writer. As with many of Sacks' books, this is a collection of Sacks observations and clinical examinations of patients with neurological "disorders". Ranging from Tourette's to severe autism, Sacks' patients run the gamut of neuro-psychological states. As is typical with Sacks, not only does he attempt to document the condition of the individuals he also attempts to document their humanity and personality. That being said, I did find this particular volume to be somewhat more clinical in tone, and occasionally somewhat speculative. However, the book is phenomenally well-documented, with abundant footnotes, endnotes, and bibliography. Hopefully readers of this book will come away with a greater sense of empathy for, and understanding of, individuals living with the documented conditions.